The University of Rhode Island’s Livestock Judging Team announced their first ever win in the North Eastern Student Affiliation Livestock Judging Competition. Although not formally recognized by student senate, the livestock judging team has been around for 30 years. But the team had yet to win a NESA competition in that time. This year’s competition took place on Saturday, Feb. 6, at the University of Connecticut. Each of the participating schools sent 32 students who were broken up into eight groups of four and then judged in three of the following categories: livestock judging, quiz bowl and research presentation. In the end, the scores are tallied up and the team with the highest overall score wins. Penn State had won the competition consecutively for the past 11 years. That is, until two weeks ago when URI ended their win streak. 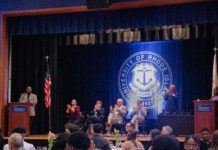 As the participating teams waited for the winner to be announced, URI’s team had already expected defeat and waited expectantly to be called in for second place. The team’s shock was evident when it was in fact the unbeatable Penn State that was announced as runner up. Team member Rachel Staffier said she remembered turning to see the surprised and overjoyed expression of her teammates. “In that moment, when they announced the winners, I looked to my teammates and I could see how happy everyone was to see their hard work pay off,” Staffier said. The livestock judging team runs year-long and requires intense preparation for the annual competition. Co-president Casey Barret added that she was “so excited for the people who worked hard all year long.” Barret, who is currently in her senior year along with seven other seniors on the team, can now leave the university with a bang after having led the team to its first-ever win against a seemingly invincible team.